Fisher Park is recognized as Greensboro’s first streetcar suburb, and is the city’s most popular historic district, receiving the designation of being listed on the National Register of Historic Places in 1992. 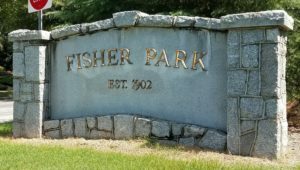 The Fisher Park Neighborhood is named for Captain Basil John Fisher, a Scotsman and Captain in the British Army, who immigrated to the U.S. and settled in Asheboro. Fisher turned a swamp into Greensboro’s most fashionable Gilded Era address in 1901 when he donated the lowlands for a city park that bears his name. Residents took full advantage of ample lots overlooking the park by commissioning the city’s best architects to design sometimes palatial homes. With the establishment of the trolley line through the heart of the neighborhood in 1902, industrialists, bankers, and professionals erected homes based on popular national styles such as Frank Lloyd Wright-influenced Prairie style, California-based Craftsmen style, and New England-inspired Colonial Revival styles. Today Fisher Park is comprised of almost 900 residences, including single family houses, townhomes, condos, apartments, and businesses, immediately north of downtown Greensboro. There are a wide diversity of homes from the 1910s and 1920s, with some dating back to the nineteenth century. Traditional, eclectic and classic homes surround plentiful sidewalks, mature trees, and Fisher Park itself, a 12-acre park with a stream surrounded by woods, natural walking trails, and a playground. Home prices start in the high $200s. Recent revitalization in downtown Greensboro has brought many new businesses to the area. Neighbors can walk to the natural food store Deep Roots Market for groceries, dine at Crafted The Art of Street Food, enjoy a beer at Joymongers Brewing Company, grab a slice at The Corner Slice or meet friends at Fishers Grill, among many other establishments. In spring and summer, residents can also walk to First National Bank Field to watch minor league baseball team, the Greensboro Grasshoppers. The Fisher Park Neighborhood Association maintains an active board and committee, including park committees and a neighborhood watch. Annual children’s events such as an Easter Egg Hunt and Halloween party are also organized by the group. Click the Apply button to see all the homes currently for sale in Fisher Park- to see this search full screen, Click Here!